Total Flooring are members of the National Institute of Carpet and Floorlayers (NICF) and actively support them by insisting our fitters are NICF accredited and stay up-to-date with new techniques and equipment. The NICF training arm FITA provides specialist courses on floor preparation and the installation including Amitico, Karndean, Specialist Installations of Sisals and Seagrass, Border Installations and preparation of all types of subfloors, including the application of moisture barriers and specialist leveling compound. Total Flooring provide a friendly and personal service with a vast combination of knowledge, experience and recognised qualifications for floor preparation and installation. This family owned business is jointly owned by father Barry, son Shaun and daughter Louise Baston who have set the solid foundations of a quality, service and value for money. Stocking a wide range of floor covering options, from carpet, wood and natural products to the highly durable luxury Karndean design flooring. Whether you are seeking classic or modern style flooring, for the whole house or just one small room, Total Flooring can recommend which flooring will be best for your home. 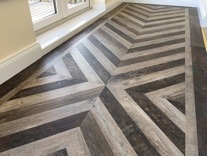 Come and visit us for flooring help and advice. We invest heavily in time, money and effort to give our customers the very best installation we can achieve. Not only do we provide in-house training but we use other training providers to gain valuable qualifications. •We treat the manufactures fitting guidelines and the British Standards for each product as they should be, which is the minimum requirement. •As well as fitting staff, all sales staff are familiar with guidelines and procedures required to install all the floor coverings we sell correctly.